Author Topic: Opinions on this composite? Hello all Posting here the composite between a man and a woman that have known each other for a few years and like each other a lot. Some outside factors making it hard to be together. But what would you say about this composite? Try the second and third links in my original post? the south node is on the ascendant which shows a psychic connection. this gives an intimate mental communication but the south node can also disguise the psychic connection and may become argument prone. 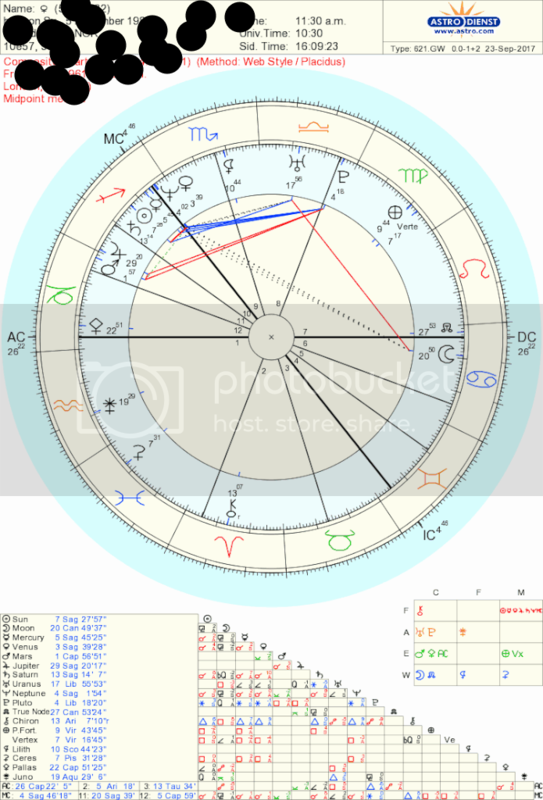 pluto is square the mars/Jupiter conjunction. this often shows that the relationship is with the context of your employment . this aspect is not favorable for romantic ventures as it pictures blind ambition at work. usually such a relationship is built upon future plans and is not concerned with each others emotional responses or needs. there is no question that there is a strong emotional and mental attraction wit the stellium of venus/sun/mercury and Neptune. this stellium could place on or both in a creative profession or possibly entertainment. This stellium gives affection and a joyous mental repartee. neptune shows a great sensitivity on personal matters but can also show the concealment of some emotional feelings. with the vertex square the sun, this is a very intense emotional relationship. but it may be difficult to intergrate the intensity of feelings into the relationship. I mean that even though there are strong feelings, these affectionate feeling may not take the relationship to another,committed ,level as one would first think. the mars/Jupiter/pluto pattern shows a selfishness and blind ambitious stance that may not make for for a serious commitment. I will say that the venus/Saturn midpoint is conjunct to the sun,so there seems to be a very strong intimacy that would be found in a committed relationship . the moon square to Uranus certainly shows a vibrant and exciting emotional connection between you. this could also show a astral connection which would manifest with common dreams about each other and a overall psychic feeling between you. uraus is quintile to Jupiter,whih again makes be think you two are involved in some type of joint venture. it may be business in nature and the quintile could imply that both of you are contributing to this endeavor. but the Uranus Jupiter quintile, while it can show a intense joint effort, easily turns into arguments when different viewpoints come into play. the juno/Jupiter midpoint is conjunct the south node and ascendant which shows that this could be leading toward marriage. the business sense is still very strong but with the node involved the emotional feelings can not be dismissed.